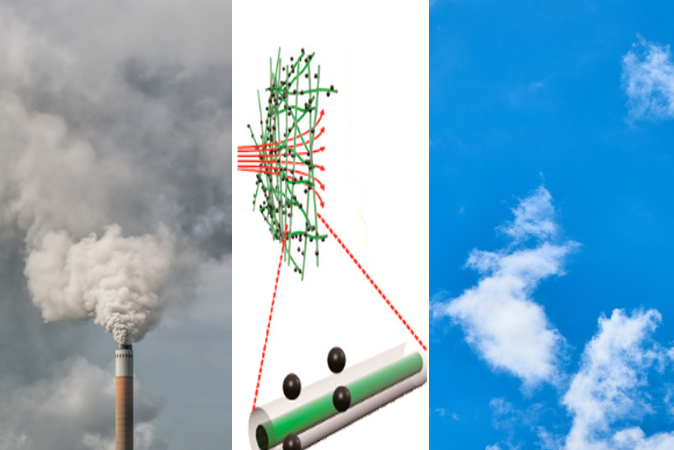 Large scale industrial processes emit many pollutants. To mitigate these emissions researchers in this study developed a new type of filter that is more energy efficient and flame retardant while still maintaining a high percentage of removal of particles from air. Particulate matter (PM) is one of the most dangerous air pollutants, as the particles can get stuck in our lungs and permeate into our bloodstream. This activates the body’s immune response which means prolonged exposure can be damaging because of the stress induced within our airways, and the effects are even worse for those already suffering from asthma or other illnesses. Because of this, emissions from industrial processes such as power generation, chemical production, and agricultural processing are filtered before being released to remove the PM. However, this can often be energy intensive, if the air is forced though a fine mesh causing a large pressure difference before and after the filter. Additionally, the emissions are often flammable, so they can cause fires and explosions. For these reasons, researchers in this article seek to design a new material for filters that fulfills three criteria: it has a high efficiency for capturing PM, air can pass through readily so that it requires less energy to operate, and it is flame retardant so that after PM builds up on the filter it does not ignite. These researchers have developed a new type of filter with a different material in the core and shell of each fiber. In the core of the fiber they use triphenyl phosphate (TPP) which is known for its flame-retardant properties, while the shell is made of Nylon-6 which effectively captures PM because it has a large dipole moment, or charge separation, which allows it to capture PM particles efficiently (Figure 1). By placing the TPP inside each fiber, it does not interfere with the ability of the Nylon-6 to capture PM particles. When the filter is exposed to a flame it causes the TPP to melt at 50 °C and then the Nylon-6 to melt at 220 °C, which releases the TPP and stops the combustion of the filter. Figure 1: Structures of TPP and Nylon-6. Synthesis of the novel filter was done by creating a solution of 1:3 weight ratio TPP:Nylon-6 and then making fibers using a technique called electrospinning, like a spider spinning its web, creating a fiber from a saturated liquid. 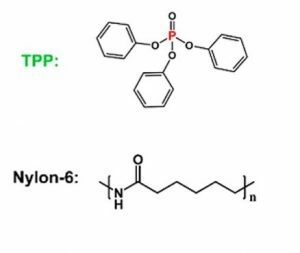 The authors attribute the core-shell structure that is created to the difference in solubilities of the Nylon-6 and TPP, where Nylon-6 precipitates first and then the TPP deposits inside the shell as the solvent evaporates. The researchers use a scanning electron microscope (SEM) to see the nanofibers (figure 2a). The authors also characterized how the filter met the criteria of removing PM from air, the energy to operate, and flame retardance. They burned incense which emits numerous pollutants and found that it was able to capture greater than 99% of the PM of all sizes. Using SEM they were able to capture images of the filter after collection of PM (Figure 2b). Figure 2: SEM images of (a) the filter and (b) the filter after it has collected PM. To ensure that the filter does not require a large amount of energy to operate researchers measure the pressure drop across the filter, which tells them about how much energy is required to push the air through the filter material. The pressure drop for this filter is only 0.2% of atmospheric pressure, which is better than many commercial filters, and the removal efficiency and throughput of air remained high even after the filter had become covered in PM. Flame retardance was tested by covering the filter in vegetable oil and holding a flame to the filter until it caught fire. The core-shell style filter was compared to a filter that was only made of Nylon-6. The Nylon-6 only filter ignited after 7 seconds and burned bright until the fuel was gone. They used the self-extinguishing time as a quantitative measure of flame retardance which was the flame combustion time normalized to the mass of oil. For the Nylon-6 filter this was 150 s/g, but for the core-shell filter created here, the researchers found that it did not ignite even after being in contact with the flame for 14 seconds. This means that the self-extinguishing time was essentially zero, indicating that this filter is highly flame retardant. 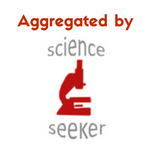 Images of the tests can be seen in Figure 3. 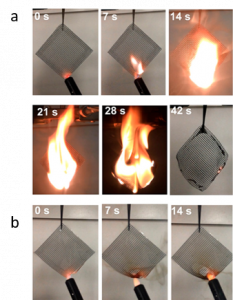 Figure 3: Images of the combustion to test flame retardance (a) shows the Nylon-6 filter while (b) shows the core-shell Nylon-6/TPP filter. The authors of this study developed an exciting new filter for PM that efficiently removes pollutants from the air, requires less energy to operate, and shows a high level of flame retardance. Implementation of this filter into industrial processing plants could reduce pollution, particularly in developing countries, while increasing worker safety with less likelihood of ignition.